ACF by Nameeks ACF CP03-W City Play 22-in. Single Bathroom Vanity Set. Modern wall-mounted vanity set. Engineered wood cabinet with metal pulls. Wenge cabinet finish and polished chromed accents. 2 soft-close cabinet doors. Choice of faucet drill holes. Rectangular white ceramic sink bowl. Includes vanity, sink, and medicine cabinet. Medicine cabinet includes neon light. Faucet not included. The ACF by Nameeks ACF CP03-W City Play 22-in. 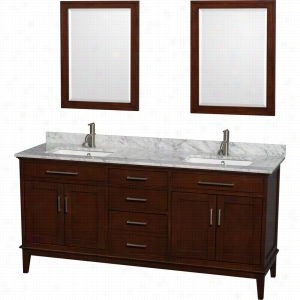 Single Bathroom Vanity Set - Wenge has modern style perfect for your bath. 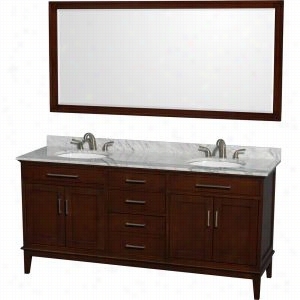 This comprehensive set includes a two-door vanity cabinet, fitted ceramic sink, and medicine cabinet with neon light. The faucet is sold separately. It has a deep Wenge finish and chromed pulls for a polished look. The vanity is wall-mounted for stability and a free-floating aesthetic. Thick pulls open the two soft-close cabinet doors to reveal ample space within. 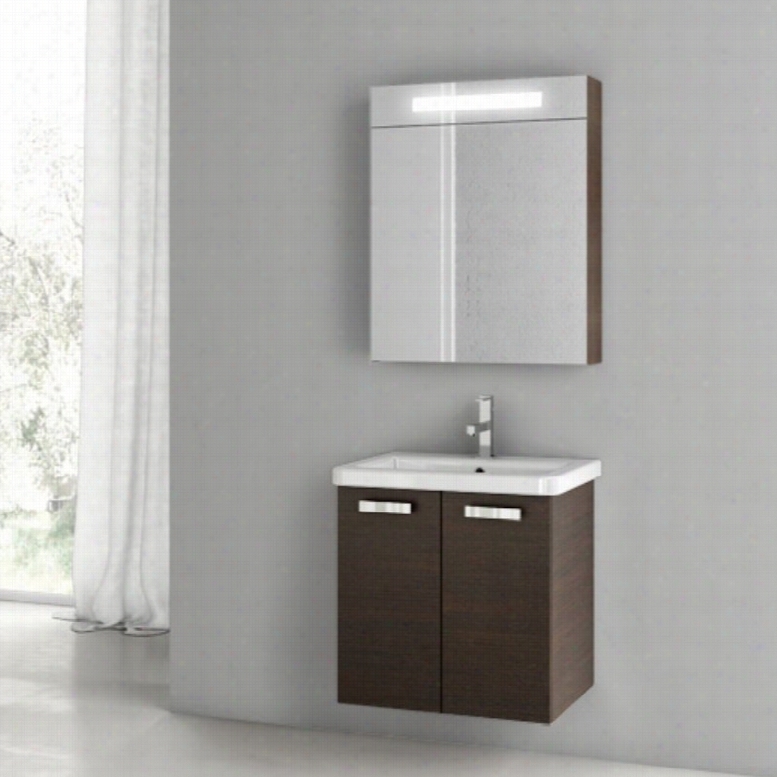 The medicine cabinet has a neon light bar that illuminates brilliantly.Component Dimensions:Vanity dimensions: 22W x 16.9D x 21.8H in.Medicine cabinet dimensions: 23.6W x 6.3D x 29H in.Fitted sink dimensions: 23.6W x 17.7D in.About NameeksFounded with the simple belief that the bath is the defining room of a household, Nameeks strives to design a bath that shines with unique and creative qualities. Distributing only the finest European bathroom fixtures, Nameeks is a leading designer, developer, and marketer of innovative home products. In cooperation with top European manufacturers, their choice of designs has become extremely diversified. Their experience in the plumbing industry spans 30 years, and is now distributing their products throughout the world today. Dedicated to providing new trends and innovative bathroom products they offer their customers with long-term value in every product they purchase. In search of excellence, Nameeks will always be interested in two things: the quality of each product and the service provided to each customer. Wyndham Collection WCS211172DGYCMUNOM24 - 72" Double Bathroom Vanity, White Carrera Marble Countertop, Undermount Oval sinks, & 24" Mirrors. 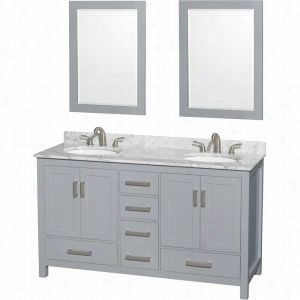 Wyndham Collection WCS211172DGYIVUNOM24 - 72" Double Bathroom Vanity, Ivory Marble Countertop, Undermount Oval sinks, & 24" Mirrors. ACF by Nameeks ACF CP05-GO City Play 22-in. Single Bathroom Vanity Set. Modern wall-mounted vanity set. Engineered wood cabinet with metal pulls. Gray Oak Senlis cabinet finish. Polished chromed cabinet pulls. 2 soft-close cabinet doors. Choice of faucet drill holes. Rectangular white ceramic sink bowl. Includes vanity, sink, medicine cabinet, light, and towel bar. Faucet not included. The ACF by Nameeks ACF CP05-GO City Play 22-in. Single Bathroom Vanity Set - Gray Oak Senlis mounts to your wall for a free-floating look. 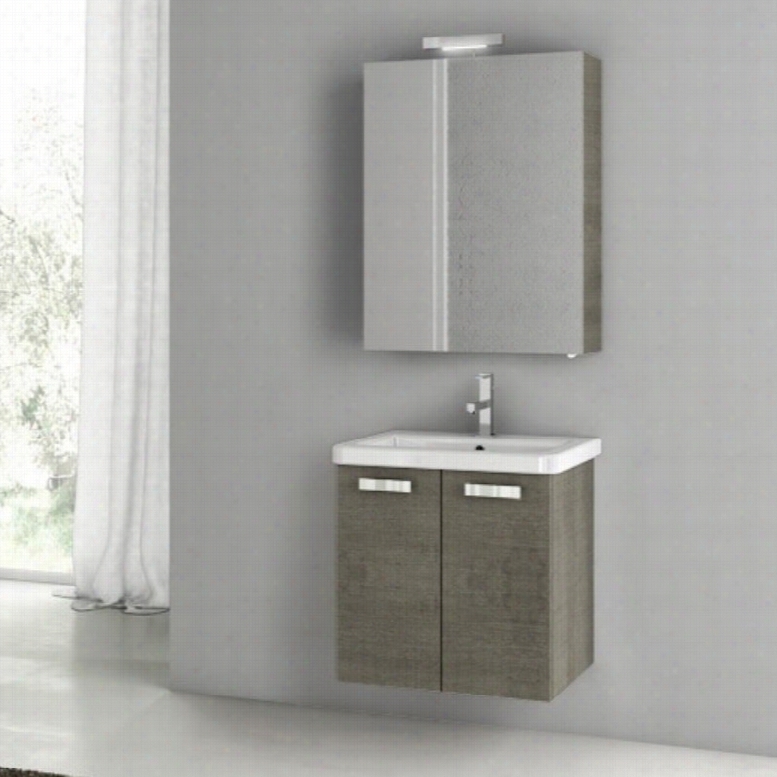 This contemporary vanity set includes a two-door cabinet, fitted ceramic sink, towel bar, medicine cabinet, and vanity light. The faucet is sold separately. 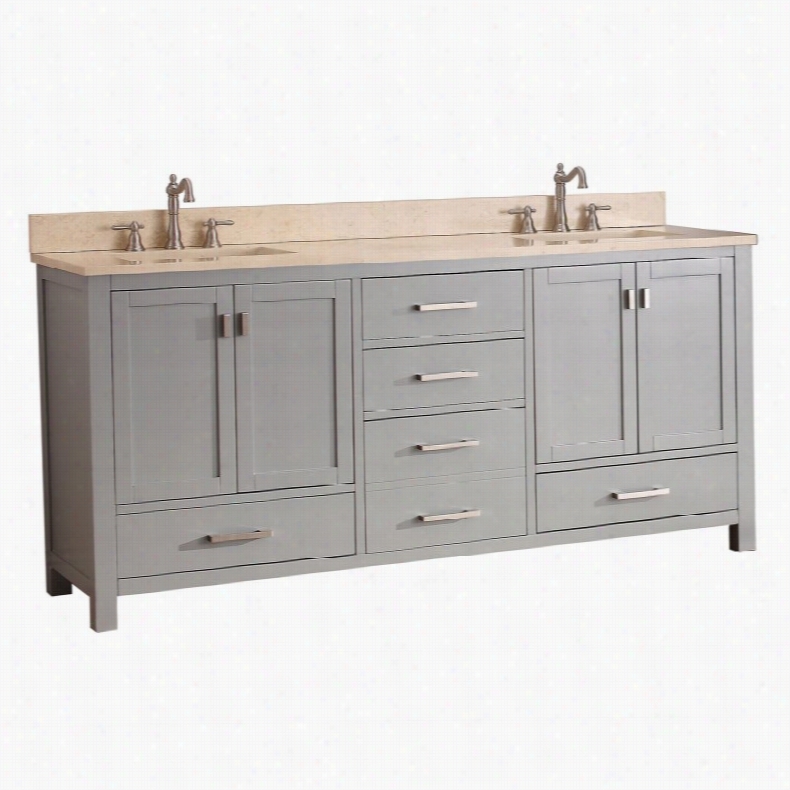 The vanity and medicine cabinet have a sophisticated Gray Oak Senlis finish, which is a perfect complement to the chromed towel bar and pulls. Two soft-close cabinet doors open to reveal ample storage space inside. The medicine cabinet is topped by a light for brilliant illumination. Component Dimensions:Vanity dimensions: 22W x 16.9D x 21.8H in.Medicine cabinet dimensions: 23.6W x 8.2D x 30.3H in.Fitted sink dimensions: 23.6W x 17.7D in.About NameeksFounded with the simple belief that the bath is the defining room of a household, Nameeks strives to design a bath that shines with unique and creative qualities. Distributing only the finest European bathroom fixtures, Nameeks is a leading designer, developer, and marketer of innovative home products. In cooperation with top European manufacturers, their choice of designs has become extremely diversified. Their experience in the plumbing industry spans 30 years, and is now distributing their products throughout the world today. Dedicated to providing new trends and innovative bathroom products they offer their customers with long-term value in every product they purchase. In search of excellence, Nameeks will always be interested in two things: the quality of each product and the service provided to each customer. 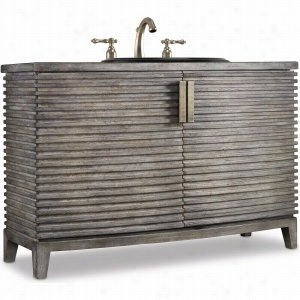 Cole & Co 11-22-275550-24 - Milano Hall Chest Bathroom Vanity. Wyndham Collection WCV161672DCDCMUNRM70 - 72" Double Bathroom Vanity, White Carrera Marble Countertop, Undermount Oval Sinks, & 70" Mirror. Wyndham Collection WCV161672DCDCMUNSM24 - 72" Double Bathroom Vanity, White Carrera Marble Countertop, Undermount Square Sinks, & 24" Mirrors. Wyndham Collection WCS141460DGYCMUNOM24 - 60" Double Bathroom Vanity, White Carrera Marble Countertop, Undermount Oval Sinks, & 24" Mirrors. Native Trails Americana Driftwood 36-in. Single Bathroom Vanity Set. Includes vanity, vanity top, sink, mirror, drain, and hutch. Vanity and mirror made from reclaimed wood. Hand-rubbed wood finish. Hand-forged recycled copper sink. Built by American artisans. Faucet sold separately. The beautifully simple Native Trails Americana Driftwood 36-in. 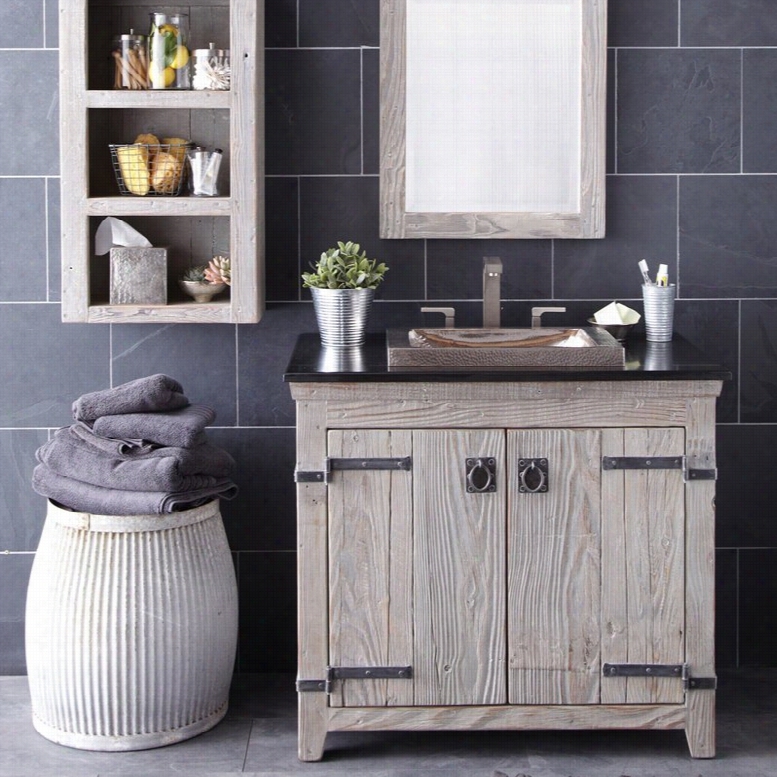 Single Bathroom Vanity Set includes six rustic, coordinated pieces from Native Trails: a 36-inch vanity in driftwood, 36-inch vanity top, sink in brushed nickel, mirror in driftwood, hutch in driftwood, and a 1.5-inch dome drain in brushed Nickel. Faucet sold separately. The wood pieces are handcrafted by American artisans from reclaimed barn wood and complemented with hand-forged iron hardware. The copper pieces are artisan-crafted and forged of quality recycled copper.DimensionsVanity: 36W x 21.5D x 33H in.Mirror: 25.5L x 21.5W in.Hutch: 19W x 9D x 33H in.About Native TrailsNative Trails was founded on the dream of combining artisan heritage, innovative design, and sustainable materials in the home. The company is dedicated to bringing the work of undiscovered artisans to consumers, with a focus on copper in the kitchen and bath. Every Native Trails product upholds these values and ideals, and comes with a lifetime warranty to prove it. Add grace and authenticity to your space with Native Trails. Avanity MODERO-VS72-CG Modero 72-in. Double Bathroom Vanity Granite Black Top. Overall Dimensions: 73W x 22D x 35H in.. Spacious freestanding double vanity. Crafted from hardwood solids and MDF. 2 rectangular undermount sinks included. Choose from several top options; faucets not included. Pre-drilled for 2 widespread faucet assemblies. You'll find the Avanity MODERO-VS72-CG Modero 72 in. 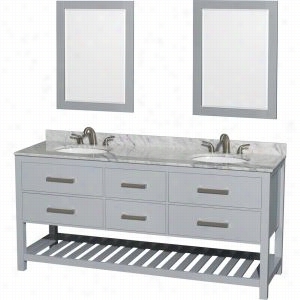 Double Bathroom Vanity &ndash; Gray an ideal addition to your traditional-themed master bathroom. Its durable free-standing base is constructed from sturdy medium-density fiberboard and fine poplar solids topped off with a handsome chilled gray finish. The base of the piece features two double-door cabinets and five soft-close drawers to provide ample storage space for all your toiletries. Metal brushed-nickel finished hardware provides reliable long-lasting service. Choose from several countertop options (subject to availability). Each stone top is pre-drilled for dual 8-inch widespread faucet assemblies (not included). Dual rectangular unmounted sink basins (made from white vitreous china) are included. A matching backsplash is also provided. About Avanity CorporationAvanity's goal has always been to provide the public with the best products possible at the fairest prices. To this end their customer service style is about listening to their customer not just hearing them. Avanity is confident in all of their products and provides a one-year manufacturer's warranty to prove it. Avanity also takes note of increasing market trends to stay ahead of the game and provide the most cutting-edge products available. Color: Granite Black Top.